Jing Tea Shop's Wuyi Bai Nian Lao Cong Shui Xian is probably my favorite of the 8 wuyi oolong samples I have recently ordered, so I'll post its review first. The dry leaf of this tea is very dark, as you can clearly see from the photo. 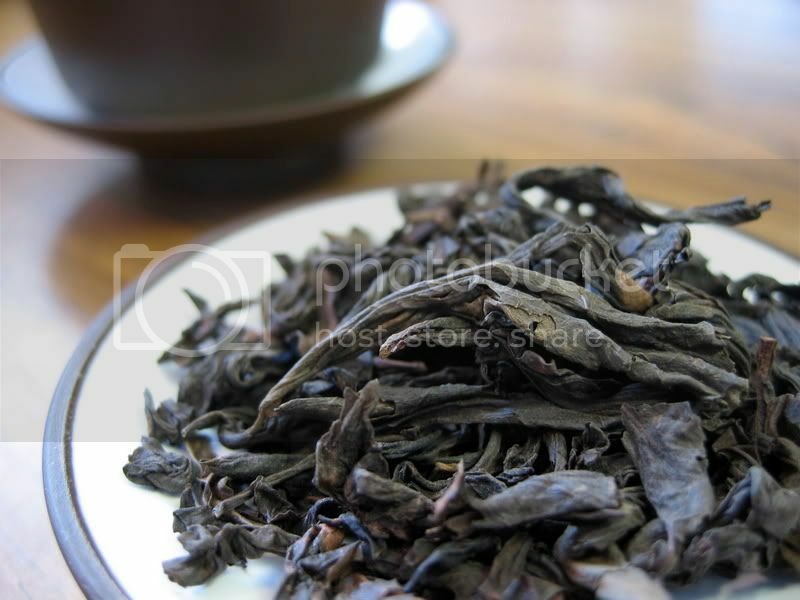 Wuyi oolongs are known for their dark leaves, due to the relatively heavy oxidation and roasting they undergo during processing. The leaves are long and windy, and quite firm feeling. Though the leaves look pretty, it's their smell that is most noteworthy—this aroma is unbelievable. Rich, bold chocolate notes fill the nose, and a touch of cinnamon/cassia gives it a little character. Subtle hints of plum (or perhaps dark berries, it's hard to say) round it out, and give a nice body. 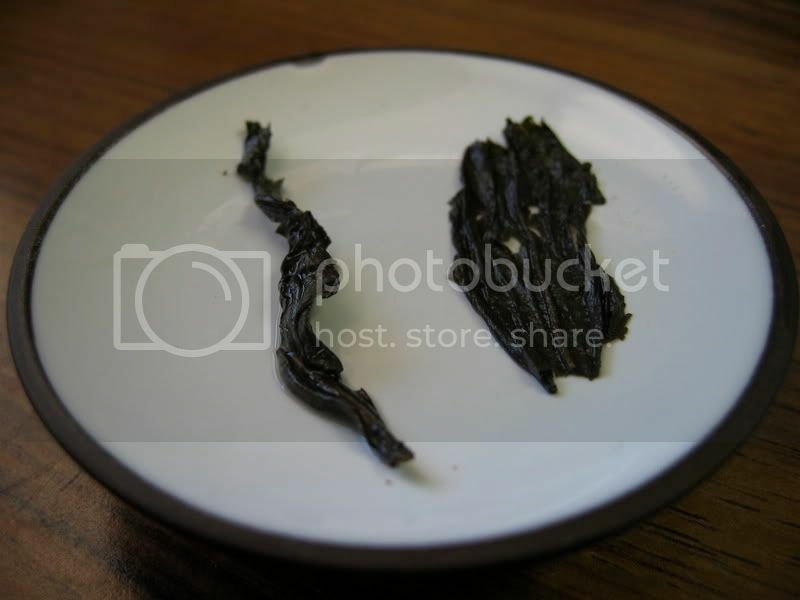 There is no charcoal to be found in the dry leaf, though it does later present itself in leaves after infusing. Though the aroma of this tea is powerful, it remains well-balanced and mellow. This is easily the best "heavy" tea aroma I have yet come across. Wet Leaves: Slight charcoal aroma, outstanding chocolate note. Some fruit, but I can't tell what. Liquor: Dark copper color. Full-bodied, fruity taste. Feels like chocolate is coating my tongue. Slight astringency. Wet Leaves: Slightly intensified charcoal, some chocolate and coffee. Liquor: Still dark copper, maybe even red color. There is a less pronounced chocolate flavor, and less body. Slight coffee flavor. Little fruit, which is surprising. Stronger astringency. Wet Leaves: Less charcoal, more fruit and chocolate again. Liquor: Less astringent than last time, but a bit drying. Chocolate has come back, as well as a bit of fruit. Wet Leaves: Coffee predominates. Chocolate aroma is still present, though. Liquor: Nice astringency. Chocolate and fruit flavors are definitely back again, but there is still not as much of a coating feeling as there was in earlier infusions. Too bad I forgot to time this one! Wet Leaves: More charcoal again. This is proving to be a very finicky tea to brew just right, at least for me. There is some coffee and chocolate in the background. Liquor: Fruit is coming through, as is chocolate. I let it cool by accident (I got distracted), but there was little astringency, surprisingly. Wet Leaves: Chocolate and coffee dominate the nose now. Some charcoal is present, too. Liquor: Lighter in color than previous infusions. Light-bodied, probably needs more steep time. Chocolate and fruit still present, but nothing is very strong in this brew. Virtually no astringency. Wet leaves: Strong fruit aroma, some chocolate and charcoal. It's interesting that the fruit aroma should come out now, of all times. Liquor: A bit weak—I think this tea is just about done. Some nice chocolate and fruit flavors are here though, despite the weakness. Nice, big leaves. Note that most of the tears on these leaves resulted from my ham-fisted handling of them, but some of them were there beforehand as a result of processing. Still, this tea went through a fair amount of oxidation and roasting, so I'm not expecting perfect leaves. I'm also not an expert at analyzing wet leaves (or anything, for that matter), but those of you who do know what you're doing can see for yourself. I think I may have found another favorite tea. Incredibly rich for the first few infusions, this tea was almost devoid of bitterness. The heavy mouth-feel and rich chocolate and fruity flavors make this a truly indulgent brew. This would make an excellent dessert tea. Due to its complexity, rich flavor, and most importantly the enjoyment I get from drinking it, Jing Tea Shop's 2005 Wuyi Bai Nian Lao Cong Shui Xian gets a 9/10. Mmmm...in a couple month's I'll be placing an order with Jing. When I do, remind me that I want this tea. It sounds amazing. Chocolate, cinnamon and dark berries? Yum. I was actually looking over Jing's site the other day and discounted this tea (and others) because it's a 2005. It's very good to hear that it's still so good. Your comment made me realize I had never even thought about the age. So, I went ahead and asked Andy about it and he said that it's traditional to let wuyi oolongs to age for a few years to mellow out the charcoal flavors. A learning experience for both of us! I just love WuYi chas! Thanks for the detailed descriptions! You suggested that it had hits of charcoal, did you find anything unusual about it? Sometimes, I have a hard time differentiating between charcoal and chocolate. Bill, I know what you mean about chocolate and charcoal smelling similar. Especially when it isn't a very strong smell, it's almost impossible for me to tell the difference. Generally though, when I say charcoal I mean there is a bit of a dry, harsh smell/taste, like you get from inhaling smoke from burning wood, while chocolate seems heavier and more velvety. Another nice review, Brent. Thanks. A lot of these Wuyi and Dan Cong oolongs have the irritating habit of tasting just enough to keep you brewing them until you just get sick of doing it. I was very interested in your cooler water method -- again -- and will certainly want to see how it works for me. With "off boil" water, I had similar experience but didn't swoon quite so much, though I seem often to have less regard for more roasted teas, there's something about that kind of sweetness that sometimes (not always) rubs me wrong. I would have been curious to see if you got more infusions with hotter water at the end, but there's only so much time in a day! Dry leaf, very dark, browns and blacks. Medium length, and somewhat curled. The scent of the dry leaf is incredible, a roasted aroma with dark chocolate and not-quite-cherries. Rich and promising. Liquor a balanced and beautiful red amber. Aroma is basically roasted - reminds me of the roasted TGY aroma from Ten Ren more than any other tea has so far. Taste is also fairly basic and roasted. Rather disappointing, really, after the scent of the dry leaf. Thin, silky mouthcoat remains inside the lips, but disappears from the tongue quickly, leaving thirst. This one is a teaser, to be sure. After infusion#1, the leaves in the teapot smell like charcoal. Not in a bad way, but the initial aroma is gone. I have, on many occasions, been taught that the dry leaf smell has very little to do with the brewed product. This tea is no exception. Charcoal is also coming across in the taste of the 2nd infusion. Not in a bad way, but I don't expect anything complex at this stage. I'll continue to infuse this. Good, but not spectacular, IMHO.